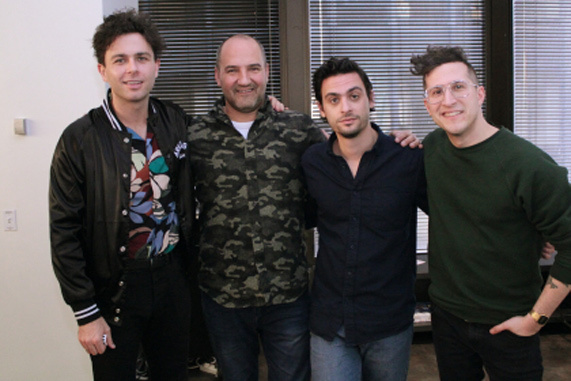 Three members of the Canadian rock band Arkells demonstrated why their full lineup is one of the hottest tickets on this year’s concert scene during an acoustic set at Cramer-Krasselt last Thursday afternoon. 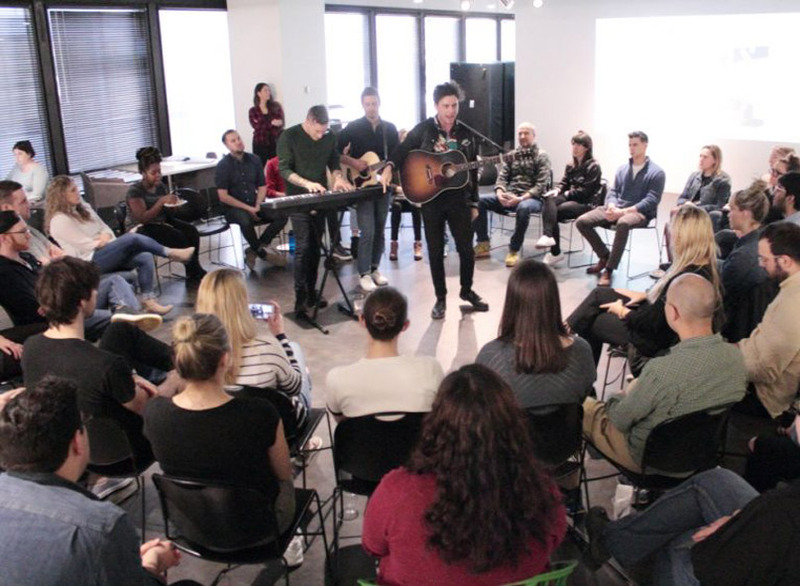 Packing arena-sized energy into a 24th-floor office space, Arkells’ lead singer Max Kerman, guitarist Mike DeAngelis, and keyboardist Anthony Carone filled the room with organic musical charm. Complete with Big Star catering and a post-performance Q&A, the event dialed the creative vibe up to 11, and the Arkells fit right in. The band opened with a pair of tracks from their 2018 album, Rally Cry, and finished with one of the trickiest songs that an unplugged male rock group could ever attempt to cover. Throughout the set, Kerman kept the mood warm by expressing a lot of Windy City love, talking about the band’s early days, and describing the process behind the music. Founded by Creative Manager Craig Likhite, the Right Brain sessions have hosted more than 65 acts to date, including KT Tunstall, Rachel Platten, Dessa, A Great Big World, Nahko Bear, Black Violin, Rixton, The Madden Brothers, Grizfolk, Waters, Jamestown Revial, Moon Taxi, and Kevin Koval. But last week’s show was all about the Arkells, and the band made that known from the get-go. When Kerman bellowed the three-note “oh” during the chorus of their opening number, “Hand Me Downs,” everyone snapped to attention. With a brief, raw wail in the middle of a heartfelt ballad, Arkells took control of the building. While introducing their next song, “Relentless,” the band shared a behind-the-scenes look at the track’s evolution. The Q&A session touched upon a handful of interests that the band shared with the crowd. For the next ten-or-so minutes, the band showed how they earned a reputation for breaking down the barriers between performer and audience. Topics included the Motown and hip-hop influences in their music, a recent hometown arena show in Hamilton, Ontario, and the challenges they encountered on the road to success. Arkells have been generating bona fide indie respect since their 2008 debut album, Jackson Square, but the band rose to widespread success on anthems played in professional hockey arenas (“Whistleblower”) and, more recently, adapted as a rallying cry for the Autism community (“Relentless”). Their current Rally Cry tour goes coast-to-coast in North America before heading to the U.K. and then returning to Chicago for Lollapalooza in August. The years of extensive gigging have helped them perfect a knack for fitting a grand sonic signature into a variety of environments. Before launching into the final song of the session, Kerman joked about the “hundred-dollar, battery-powered device” that Carone purchased for day’s round of engagements, which included an Audiotree session right before the show and a gig at Bottom Lounge later in the night. “The sound bank is pretty diverse,” he told the crowd. “It’s got dogs,” added Carone.